This Boxing Day marks the centenary of the death of Private Albert George Cooper [10/380], one of New Zealand’s earliest casualties of the First World War. Private Cooper, of Hawke’s Bay, never saw battle. Eight days after his arrival in Egypt with the NZEF he was hospitalized, suffering from pneumonia. He never recovered and died on 26 December 1914. Albert was born in Hastings in 1891, to William and Elizabeth Cooper, of Tarapatiki, Waikaremoana. His occupation on his attestation forms is given as a painter, his last employer S. Sargent, of Wairoa. He is described on enlistment as 5ft 8 inches tall, 126lb, of dark complexion, with brown eyes and hair. Albert enlisted with the NZEF in the 9th (Hawke’s Bay) Company of the Wellington Infantry Battalion in September 1914 and sailed with the main body on 16 October. 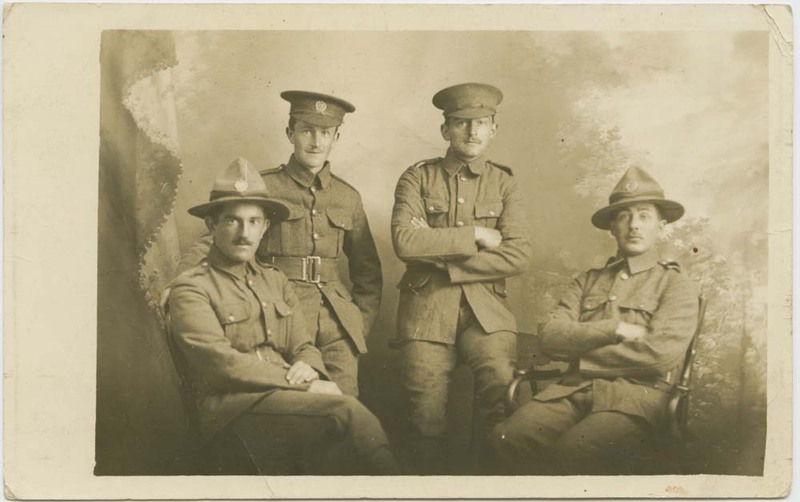 Photograph of Private Albert Cooper (front left), and three other unidentified soldiers taken at Electric Studio, 90 Manners Street, Wellington, October 1914, prior to the departure of NZEF. He arrived in Alexandria, Egypt on 3 December 1914 and as a young man on his first trip abroad, would have been impatient to see the sights. The NZEF disembarked at Alexandria and most of the New Zealand force entrained immediately for their camp in Zeitoun, on the outskirts of Cairo. However, Albert, as a member of the Hawke’s Bay Company, was, along with the Taranaki Company and Battalion Headquarters given the task of staying on in Alexandria to complete unloading the transports. The men went thronging into the city. And what a night they had! At midnight they came back to the familiar holds but not to sleep. They had seen marvels and must recount what they had seen. Excited men talked at the top of their voices. No one listened to anyone else. Everyone was too full of his own experiences—and so the babel flowed on. 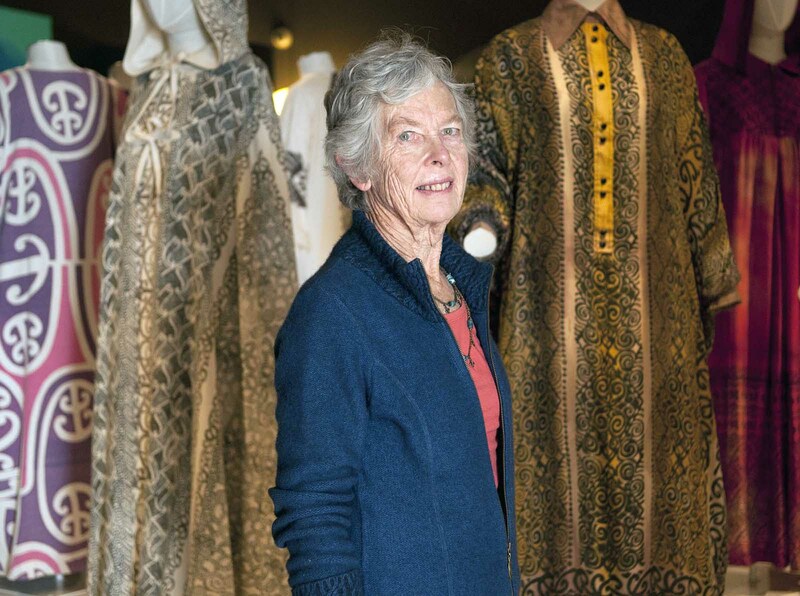 In one evening they had seen Aladdin’s Cave, the Forty Thieves, and the houris of the Thousand and One Nights; veiled women and others whose draperies were of the most diaphanous sort. French, Greeks, Russians, and Italians, with the brown-skinned Egyptians and black Nubians from the south—all these they had seen and the spell of Egypt had taken hold of them. Went ashore this evening to Club de Anglais of which we have been made hon. members. The best quarter of the city is very well built and very fine at night when all lit up as I saw it tonight. But the native areas about 2 miles of which I passed in a cab going to the wharves, have narrow streets, most evil smelling, and cafés, saloons and open bars etc galore. The work of unloading horses & military stores goes on and trains for Cairo leave every hour or two. Men of the Hawke’s Bay Company were given a half-days leave on the 5th to visit Alexandria, before departing for Cairo on the 6th. 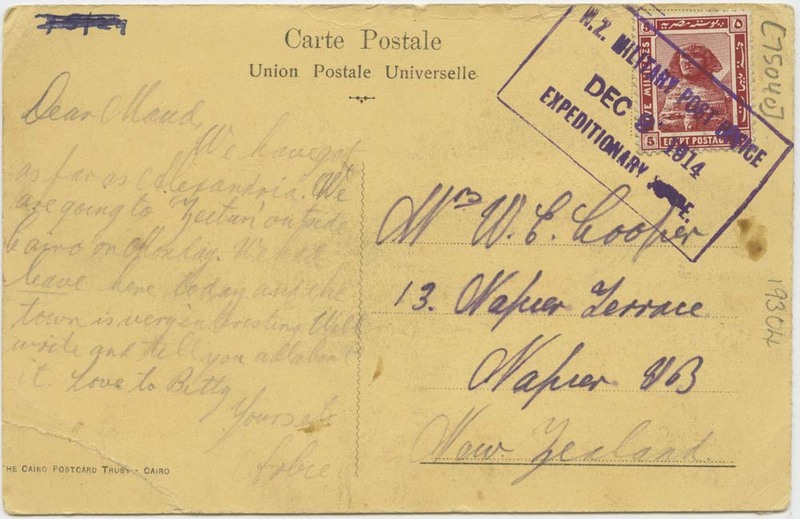 In the museum’s collection we hold a postcard, likely written on 5 December, to his sister-in-law Alice Maud Cooper. 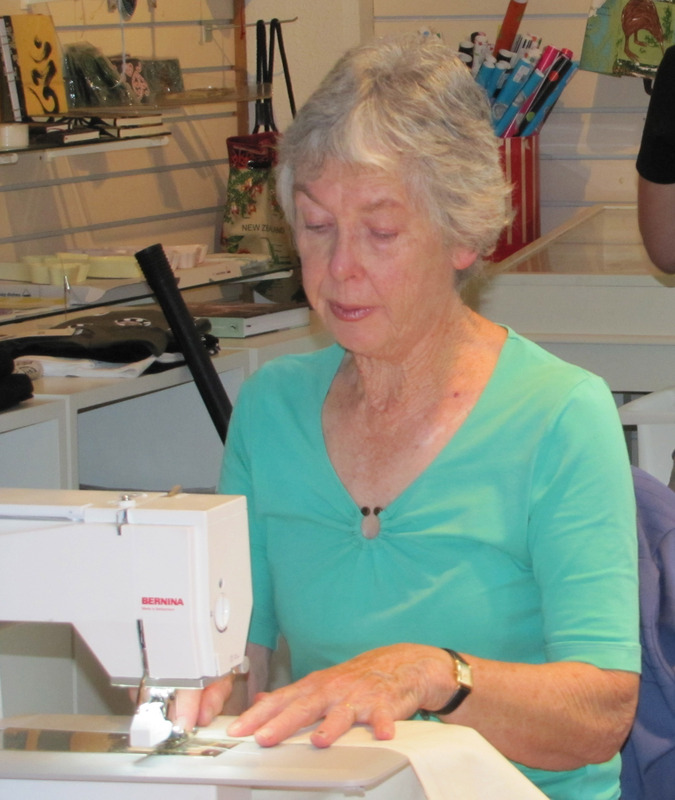 Maud was the wife of his older brother William Edward Cooper, watchmaker of Napier. In the short note, Albert (or Albie, as he signs off) gives his love to Betty, their daughter, his three year old niece. We have got as far as Alexandria. We are going to ‘Zeetun’ outside Cairo in Monday. We have leave here today and town is very interesting. Will write and tell you all about it. Love to Betty. Albert reached camp at 6pm on the 6th December after a train journey south through the heart of the Nile Delta. The regiment’s unit history recounts the difficulty of the first days in camp at Zeitoun. The camp was at first no more than a bare patch of desert, and the air described as very bracing after the stuffy conditions aboard ship. On the first night men slept on the sand wrapped in great coats and blankets. The ground was cold, and the air frosty. The author of the Wellington Regiment’s unit history wrote “those who were privileged to experience that first night’s bivouac on the sands of the Egyptian desert will long remember it as one of the coldest of their lives.” The first night’s exposure in the desert produced a mild epidemic of influenza and some twenty men were sent to hospital the first day. The desert training regime was intense, but outside of their work, the sights of Cairo were an irresistible lure to all ranks. 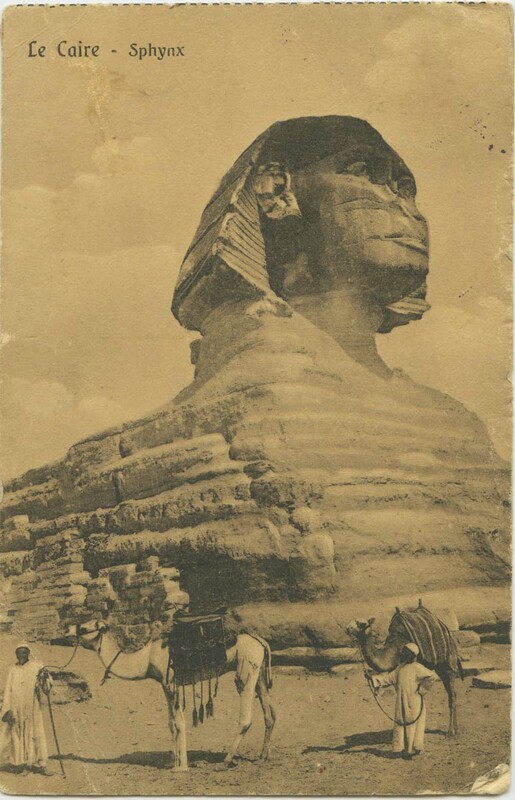 We do not know if Albert had the opportunity to visit Cairo, or see the wonders of ancient Egypt – the Pyramids, the Sphinx on his picture postcard home – before he succumbed to illness. On the 10th December, five days after this postcard was sent, Albert was admitted to Abbassia Hospital, a British facility, east of Cairo, with pneumonia, along with fellow Hawke’s Bay soldier John Archibald Campbell, driver for Barry Bros of Napier. John Campbell died on the 14th, while Albert remained seriously ill in hospital, eventually passing away on the 26th. Respiratory diseases such as influenza, tuberculosis, pleurisy and pneumonia were rife in Egypt and struck many of the new arrivals from Australia and New Zealand. We do not have a record of his funeral, but Albert’s death is noted in the diaries of other soldiers in his unit. It is possible that his next-of-kin were cabled with news of his death, and it was widely reported in the New Zealand papers from 30th December. The news must have come as a shock to the tiny East Coast community in which he grew up. His brief postcard from Alexandria, would have arrived in Napier much later and must have been a treasured remembrance of Albert, and his grand adventure, cut tragically short. Thus far, it is the only known letter of Albert’s to survive. 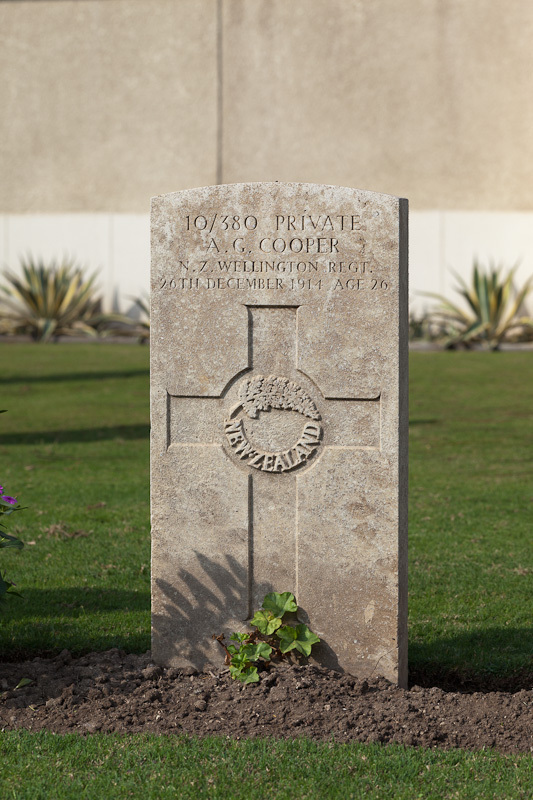 Private Cooper is listed as aged 26 on his memorial, though he was actually only 23. The museum also holds Albert’s Memorial Plaque in its collections. 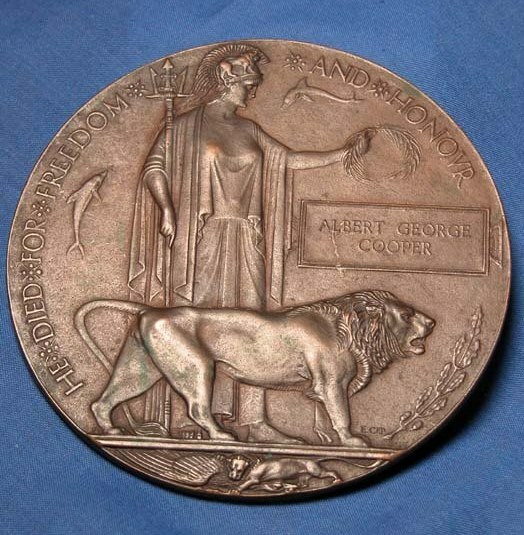 These were issued after the end of the war to the next-of-kin to all British and Empire service personnel who were killed as a result of the war. The full name of the dead soldier is engraved on the right hand side of the plaque, without rank, unit or decorations. They were issued in a pack with a letter from King George V and a commemorative scroll. These plaques were colloquially known as the ‘dead man’s penny’ because of their resemblance to the penny coin. The First World War was the first major conflict in which the overwhelming majority of military deaths were battle-related, rather than caused by disease. Of the 16,703 New Zealanders who died during the war years, 63% were killed in action, 23% died of wounds, and 11% of disease. Regiment N.Z.E.F., in whose keeping is its good name. We arm for men that are to be.